When Alexis “Lexi” Buckalew receives her diploma on December 15, 2017, it will be a momentous occasion. Not only is she graduating one semester early–an accomplishment in itself–but Buckalew, who has Muscular Dystrophy, is determined to walk across the stage, a testament to her tenacity. Never one to let obstacles get in her way, Buckalew knew she wanted to attend college and chose Penn State Berks because of its friendly atmosphere and accessibility. “Everyone was so welcoming and talked to me right away when I visited the campus,” she comments, who goes on to explain that she was pleasantly surprised by the experience since it was very different from high school. Originally planning to major in Architecture and complete her degree at University Park, Buckalew changed her major to Business with the Marketing/Management Option and a minor in Entrepreneurship and Innovation and remained at Berks for three-and-a-half years. One of those close relationships is with Karyn Sulpizio, a Rehabilitation and Human Services major at the college who helps Buckalew with some daily tasks. When Sulpizio overheard Buckalew talking about her struggles with an unreliable nursing service, she volunteered to help out. She found that she could help her friend as an employee of PCG Public Partnerships. In the process they became best friends. Other than needing some limited assistance, Buckalew is very independent. She stated that the campus is accessible and she didn’t have any issues with getting around and doing everything she wanted to do. “I was able to do everything–I even went on campus bus trips to New York City and Flyers games. I never thought I would be able to do those things. I sometimes forget that I’m in a wheelchair,” she states. Buckalew not only excelled academically during her time at Berks–she made the Dean’s List four consecutive semesters–but she was also very involved on campus, serving as an outreach captain for Berks benefitting THON, a member of the Campus Activities Board, part of the lead team for new student Orientation, and the student government representative for Berks Cares, a student service organization. In fact, during her sophomore year she was honored with the Campus Life Award. 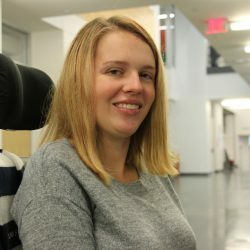 Through the Business degree program, she completed an internship with the Muscular Dystrophy Association, where she helped to organize a muscle walk, handled their social media, and helped coordinate the “lockup” fundraising event in which community members “get arrested” and raise money for their bail to benefit MDA. Buckalew states that her education at Penn State Berks covered all the bases and she feels that she has learned everything she needed to know to enter the business world.